A few weeks ago, our friend AW ran a one-off episode of the role-playing game Masks for me, my husband Edmund, and two more friends, SP and MP. I thought this was a good time to talk about this game since the PDF version just became available on DriveThruRPG. First, I share a play report that goes a bit long, but talks about the mechanics as well as the fiction generated in play. I follow with a review of the game. Edmund had planned a more complex character but decided to simplify because it was a one-off game with limited time. He defaulted to his staple when trying a new game, the brick or in this case, the Bull. He created Thump, who had been the victim of an illegal super-soldier serum experiment by Evil Corp (yes, we borrowed the name from Mr. Robot.) Despite acquiring immense strength and martial arts expertise, Thump was a tall but shy and gentle African-American girl aged about 15, who took care of her lower-middle-class family. Thump had a secret crush on her friend Mai and a bit of a rivalry with the overly helpful FSM, and had been noticed by a local hero, Badger, who had become her mentor. Edmund picked the Bull moves You’ve got a head you don’t need, In a china shop, and Defender. My character; I had picked a delightful sketch, Punk girl sketch by SAM—tan on deviantArt, as my inspiration. Her powers were teleportation, which she used frequently and showily, leaving a momentary cloud of pure blackness behind; and power negation, which she kept a secret. These powers were stolen from another Evil Corp experiment when she and Cass went to rescue Thump, in an awesome illegal stunt. I picked the moves Criminal mind, Troublemaker, and Are you watching closely? from the Delinquent playbook. Mai was a third generation Thai immigrant from the same lower-middle-class neighbourhood as Thump, with a close bond to her grandmother. I was the first to decide on my character. I confess that one reason I picked this playbook was to prevent its misuse: SP is a great guy but in RPGs he likes to pull against the rest of the group so I was worried that he would be attracted to this playbook as the most disruptive. And I was pretty sure that if he did, he would pick the other, more disruptive playbook moves: Mary Contrary, I don’t care what you think! and Team? What team? MP likes to play magical characters, so she created Cass, a Romani girl from a family of travelling entertainers, with innate powers of sorcery that she learned to control through complex dance steps under the guidance of her grandmother. Cass was a cheerful, mischievous daredevil, often pairing up with Mai to cause trouble but friend to all. Underneath the happy façade and the leadership, however, lurked unspoken insecurity. MP picked the following effects or “flares” from the Nova playbook: Reality storm, Shielding, Move, and Overcharge. As a special effect, Cass started to glow whenever she danced, and particularly when she used dance steps to control her sorcery. Yep, SP picked the playbook that was the second most likely to be at odds with the group, the Outsider. And called him FSM. From the planet Pastafar. His powers were alien weaponry, and telepathy and mind blasts. His demeanour was cheerful, and he picked the Outsider moves Belong in two worlds, Alien tech, and Alien ways. He took both his relationships with Cass, on whom he had a crush. FSM was on Earth to study humans but was overdue for his report to Pastafar because he wanted humanity to survive and feared that it would be merely catalogued before Earth was resettled. See, SP doesn’t really like RPGs (he prefers wargames) and only has one mode when role-playing: ironic. This works wonderfully when we play Fiasco, but at other times can be difficult for a game-master to handle and for other players to interact with. More on this later. Because of the way we described and assigned our characters’ relationships, everyone had Influence over all other characters except for Cass, who did not have Influence over Thump. Our game-master AW asked each of us questions in turn so everyone contributed to the backstory. We decided that we had become a team when Thump went missing and Mai tracked her friend to an Evil Corp facility where she was being used as an unwilling experimentation subject. Mai went to her fellow troublemaker Cass for help, and Cass in turn recruited FSM since they would need all the help they could get to infiltrate the facility. It was located under a parking garage in downtown Halcyon City, and also served as headquarters for Evil Corp’s own super-team, Control-7. NPC: Agent 13, leader of Control-7, enhanced with cybernetics. The trio managed to get to the underground laboratories, where Thump — no damsel in distress — had already begun her escape with a good deal of property damage. Ever the vandal, Mai tagged the lab with spray paint, then helped with the destruction of private property — and messed with an experiment in progress that gave her new powers. 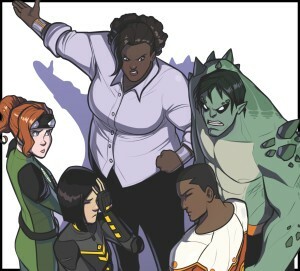 As the four teens were making their escape, they ran into Control-7 and their first super-powered battle. 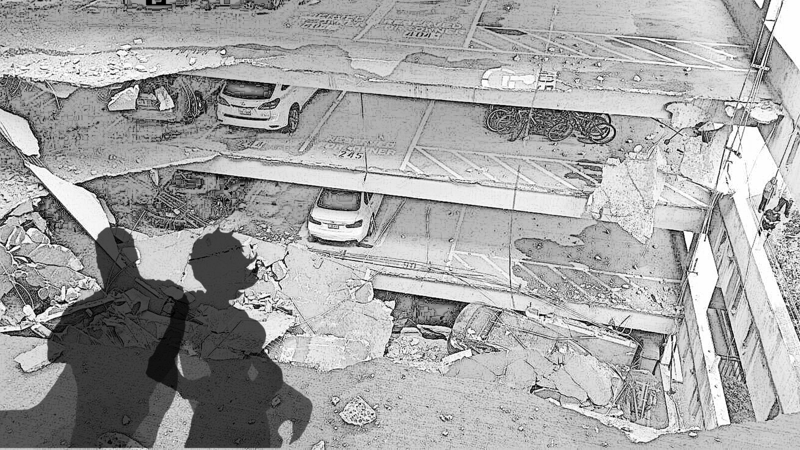 In the process, Cass overcharged her powers of sorcery, unleashed a reality storm, and ended up destroying the entire parking structure located above the secret facility. Control-7 and Agent 13 were defeated but the new heroes then had to scramble to rescue civilians from the collapsing structure — including a prominent citizen, the mayor of Halcon City himself — and their heroics were captured by news cameras! NPC: Elias Burke, mayor of Halcyon City. Old, portly, a good deal-maker. The GM asked who we had impressed, and we decided this was when Thump had impressed Badger, a local superhero protecting the neighbourhood. NPC: Oliver West, a corporate executive at Evil Corp and retired general who had engineered a false flag operation. NPC: Faun, West’s super-sidekick, who has psychic powers. The young heroes glimpsed lots of military-grade hardware before they escaped the secret facility and the collapsing parking garage. Cass, FSM, Mai and Thump were hanging out with their mutant friends from the low-rent side of town, shooting the breeze. Some of their friends with less obviously useful powers were challenging the new media darlings, but silly quarrels were easily broken up. NPC: Maurice, a young mutant friend of the heroes. Three out of four weeks, he has perfect skin but on the fourth he molts and his skin sloughs off in chunks like a beluga’s. When under great stress, he grows spikes like a porcupine but has no control over this ability. NPC: Latesha, a friend of the heroes; lately, she’s been afflicted with a persistent cough. Mai pulled the fire alarm to evacuate the mall, and saw an Evil Corp delivery drone pick up the blood samples. She chased after the drone to the parking lot outside. The rest of the team also showed up, helping evacuate their friends and other mall patrons and employees. A tactical van from Control-7 rolled into the lot and screeched to halt; a fight ensued! [We enter battle against a dangerous foe as a team and start a Team pool with only two points because the leader is unclear and we have different purposes, to recover the blood samples and to beat Control-7.] Agent 13 captured Maurice and used him as a hostage. Thump slammed down the drone to prevent it from escaping, while Mai distracted Agent 13. Worried about the side effects of her more offensive powers since the recent collapse of the parking garage [Afraid condition], Cass used her shields to protect civilians and Mai, and FSM telepathically took control of the rest of the Control-7 team, making them shoot at Agent 13. Terrified by the situation and by Mai’s attempts to get him to deploy his spikes, Maurice started molting instead, dropping foul-smelling gobbets of flesh [i.e., a miss on Mai’s roll for the basic move Provoke Someone.] Agent 13 threw him with superhuman force to cause a distraction, and ran off. Mai and Thump raced to catch Maurice, just barely managing to save him. FSM sent the rest of Control-7 scurrying… but Agent 13 managed to grab the blood samples from the downed drone and escaped with them. 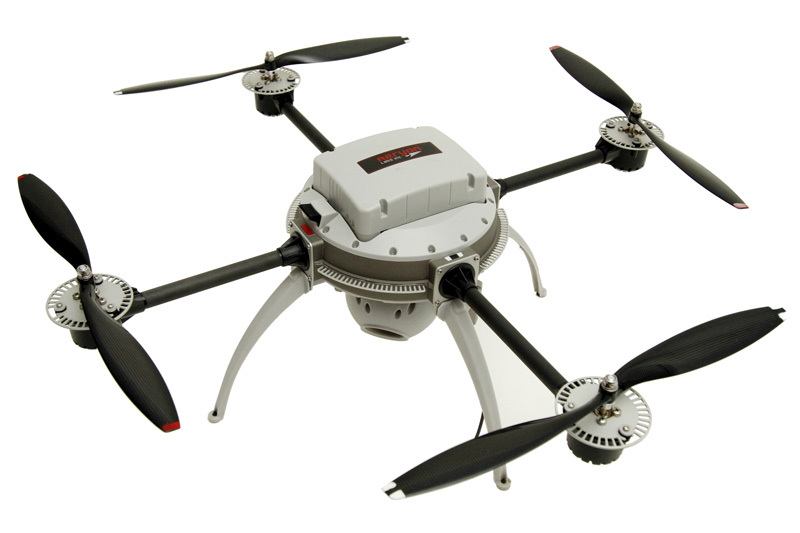 Another Evil Corp sample collection drone swooped by and grabbed Cass! The rest of the team raced to follow as the drone flew toward Chromozyme Tower in the sparkling business core of Halcyon City. Upon reaching the skyscraper, the drone dropped Cass down a chute — and her friends dove in behind her! At the bottom of a long slide, Cass found a large white, nearly featureless lab room that started filling with purple gas. Cass reacted instinctively by throwing all the magical power she could summon at her surroundings, going to her “happy place.” The smooth white floor turned into a wooden ballroom floor, streamers dropped where electronic equipment had been, and the place was transformed… up to the edge where Cass’s sorcery met with the purple gas and faded. FSM mentally seized the Control-7 team as he had the previous one, and tried to do the same with Faun… who lashed back and made him turn his powers against Thump to cause her to let Oliver West go. Meanwhile, Cass called on her magic again to create a reality storm. Suddenly the basement laboratory became the penthouse suite of a skyscraper overlooking a dead Halcyon City in an alternate reality where the Drakaran plan had succeeded. [Overcharge + Reality storm + oops… rolled snake eyes.] Realities collide! Cass was transfixed with horror. Mai realized what Faun had done to FSM and decided to shut her down. She teleported in direct contact with Faun and revealed her ability to negate powers! Faun’s disguise fell and her true Drakaran form was revealed — including fangs and claws that were enough to make Mai back off. Faun then ran up to Thump and slapped a suspicious, circular device on the large woman’s back. Thump grabbed the lizard-like Faun before she could escape, telling her they would share whatever this surprise was! In the melee, Oliver West had started launching micro-missiles but FSM was using telepathy to interfere with Oliver’s targeting and keep the damage contained. At long last, Oliver was brought down. Mai negotiated a truce with Faun, while the alien’s telepathy was still negated. She bluffed that Earth was under the protection of Pastafar. After making her detach the device she had stuck to Thump’s back, Mai allowed Faun to leave on the promise that Drakarans would leave Earth and the Solar System alone. Mai sent everyone to evacuate the building, pointing that she could teleport much faster than they could run. Thump was very unhappy with this plan, but reluctantly went along. Mai then used Faun’s bomb (yes, that’s what the device was) to destroy the underground laboratory and teleporting away just in time [a great way to clear an Angry condition, let me tell you!]. The team were left with questions: was the Zero Plague a creation of the Drakarans, and if so, was it meant to transform or kill the super-powered? What would be the fate of people who had already received the Drakaran serum? Why did Evil Corp collect blood samples? 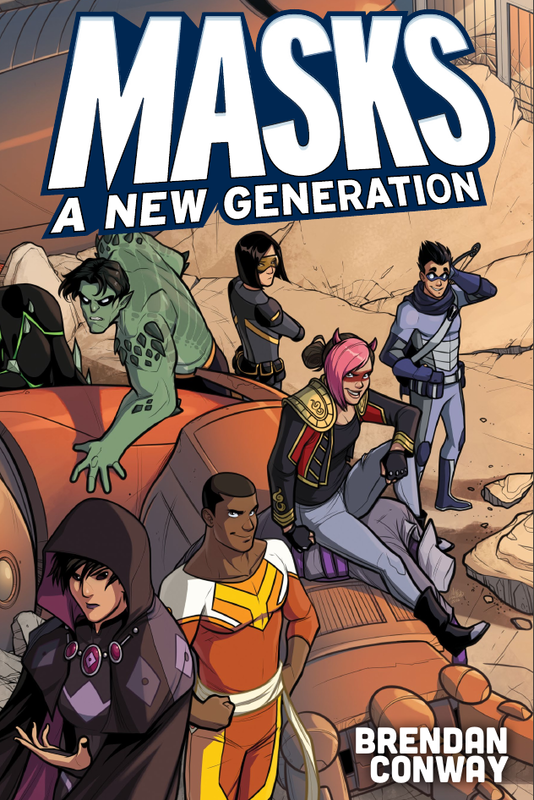 Powered by the Apocalypse (PbtA) and published by Magpie Games, Masks is a game of young superheroes in the vein of Young Justice or Teen Titans. The book is written by Brendan Conway and beautifully illustrated by Michael Lee Lunsford (of Supernormal Step fame), with an attractive and legible layout by Daniel Solis. Thanks to a highly successful Kickstarter funding campaign (2,371 backers pledged US$107,328, compared to the original goal of $4,000), several extras and supplements will also be released; most promising are three supplements (Halcyon City Herald Collection, Masks: Unbound, and Secrets of A.E.G.I.S. ), as well as two visual play aids, the Hero Deck and the Deck of Villainy. In addition, Magpie Games makes several play aids available for download from its website, free. A bit of personal opinion, and the lens through which I will evaluate the game: I don’t consider PbtA to be a system so much as a play style and a compendium of codified GM advice. Mechanically, it boils down to rolling two six-sided dice and checking for a result of 7 to 9 or of 10 and above, then reading the result off a little chart. What matters is whether said little chart is any good; in other words, every PbtA game lives or dies by the quality of its game-specific moves, how they chain or build up, how they bring fiction that is interesting, exciting, in genre, and will provoke the players to take action. Additionally, the best PbtA games have their own little mechanical refinements in the way they provide for extra effort, how relationships between characters work, how experience is earned, how threats are built and act, and so forth. 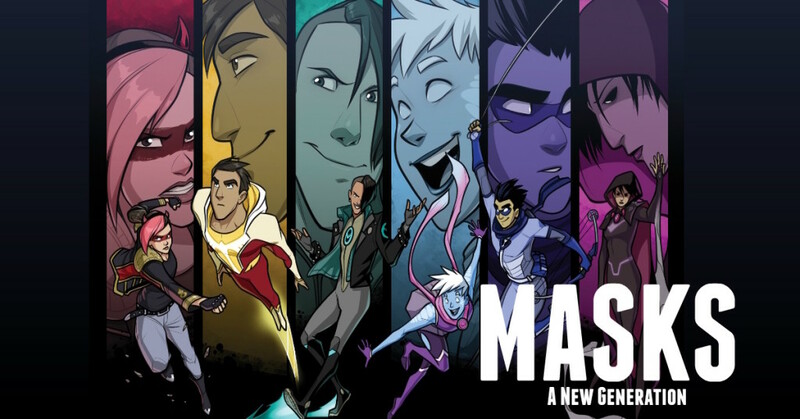 Chapter 1 of Masks first sketches a default setting, Halcyon City, but only in broad strokes: what it feels like, and how it’s been affected by four generations of super beings. If you’re looking for ideas for locations and characters, this isn’t it; you’ll want to look out for the Halcyon City Herald Collection, a supplement slated to come out later this year. In the meantime, you can draw inspiration from comic book settings like Astro City, or game settings like Freedom City and Emerald City (for Mutants & Masterminds, published by Green Ronin Publishing), Stark City (for Icons, published by Fainting Goat), etc. The first impression when you start character creation is that the ten playbooks you can choose from are good, solid visions, well put together and easy to conceptualize. These are referred to as the basic playbooks; the advanced playbooks will be released in the upcoming supplement Masks: Unbound. The moving parts to consider when picking your playbook are their moves, which tell you how the character affects the world around her; and their team moves and Moment of Truth, which tell you where the character’s growth is headed. If these don’t interest you, look at a different playbook. Freak, which is all about being strange, unusual, unknown, different, unique, powerful, weird, and special. Danger, which is all about being strong, threatening, violent, destructive, badass, frightening, reckless, and mighty. Savior, which is all about being defensive, protective, overbearing, moralistic, guarding, patronizing, and classically heroic. Mundane, which is all about being normal, empathetic, understanding, kind, boring, simple, uninteresting, and human. These Labels’ ratings can change as the character’s self-image evolves with the use of some playbook moves, using Team pool points selfishly (see below), or when someone exerts Influence over her; the change usually involves raising one Label rating by one point, and lowering another by one. Influence is another of Masks‘ innovations: it is a currency used to gradually shape others’ self-image. All adults have Influence over the young heroes, but other teens’ Influence (mostly other player characters) is determined by the way relationships are treated in your playbook. While this appears similar at first to History, Bond or Regard as used in other PbtA games, Influence goes further. Not only can it modify the roll for some moves, but it can also change another character! The team creation step and collective generation of the heroes backstory is great fun and should not be skipped, even in a one-off game; not only does it provide group cohesion and player buy-in, but it will generate ample material and trappings for the first adventure. Enter battle against a dangerous foe as a team allows you create a Team pool that will be used to add to rolls during the scene, much like the Mission pool in Night Witches. However, points from the Team pool are normally spent to add to a teammate’s roll by helping them. Act selfishly lets you add from the Team pool to your own roll and switch a Label up and another down by one each, by ignoring or insulting your teammates. If you’re Angry, take -2 to comfort or support someone or pierce the mask. Cleared by hurting someone or breaking something important. If you’re Afraid, take -2 to directly engage. Cleared by running from something difficult. If you’re Guilty, take -2 to provoke someone or assess the situation. Cleared by making a sacrifice to absolve your guilt. If you’re Hopeless, take -2 to unleash your powers. Cleared by flinging yourself into easy relief. If you’re Insecure, take -2 to defend or reject others’ Influence. Cleared by taking foolhardy action without talking to your team. You can also help a teammate clear a Condition by using the move comfort or support someone, and you can clear one of your own Conditions using certain moves, such as defend someone. If you need to mark a condition and all conditions are already marked, you’re taken out: you lose consciousness, or flee—you can’t continue with this scene. Finally, the meat and potatoes of PbtA, the moves — basic moves, playbook moves, team moves, session moves, GM moves, villain moves, etc. — are well crafted to chain by triggering other moves. They present interesting choices even on a result of 10+, so that each move has open-ended effects, not just “you succeed.” The fiction created by using the mechanics propels the story and action in different directions. Together, Influence, Conditions, and chained moves generate new events that fit well in the genre. If it’s not clear by now, Masks is about change. Labels will change throughout any episode with the heroes’ self-image, Conditions and thus heroes’ state of mind will change, relationships and Influence will change as a result of team moves, and of course with advancement the characters will gain both power and emotional baggage. With enough advancement, the young heroes mature and eventually start having access to adult moves. Finally, they will eventually come to their Moment of Truth (different for each playbook) and choose who they really are. I regret that I have not had a chance to see a multi-episode tale unfold but it feels like there would be a lot of maturing and transformation. Much of the GM advice will look familiar to those who have played other PbtA games, particularly in Chapters 7 and 8. However, it is well tailored to the genre, well written, and supported by extensive examples. I appreciate this; many authors hate writing them and as a result some games are skimpy on examples, even though they are one of the best ways to make the rules more accessible to the reader. Building on the PbtA play structure, Masks adds its own toolbox that really makes the GM’s life easier when it’s time to improvise in reaction to the players’ moves. First, in addition to general GM moves, it offers playbook moves — five specific GM moves for each playbook so that you have guidance to push the buttons of specific player characters. Want to rattle the Legacy character? Remind them of their traditions or Compare them to the past. Is the Transformed being wishy-washy? Show how they are feared or hated or See their true self. Next comes the creation of threats; while Apocalypse World has Fronts with a variety of specific threats and Monster of the Week has Mysteries and monsters, Masks has villains, of course. Each villain has a drive (for example, To spread their influence and power across the city or To free itself from this form, and two or three powers. The villain’s capacity for lasting in a conflict, and thus how dangerous they are, is determined by the number of Conditions they can take, from one to five. I find that three or four Conditions make for the most interesting villain if not the most powerful; deciding that a particular villain cannot feel Guilty or Hopeless, for example, tells me a lot about how they will behave. But a villain’s list of available Conditions does not only spell out toughness; each Condition comes with five moves, and whenever a Condition is inflicted on the villain, they react immediately with a Condition move. This, along with the playbook-specific GM moves, guarantees that a rematch fight with the same villain will not replay exactly the same way as the first encounter, a problem I often notice in games where the mechanics make a particular tactical option (e.g., “I hit him with my Freeze Blast!”) vastly preferable to the others. In Masks, story seeds are organized in hooks and arcs. Hooks are addressed at individual heroes, in the form of a pair of Labels the GM will tug on, using non-player characters and putting in motion events that will trigger a particular response. The GM should play around with these for three or four sessions for a given character, then pick a new pair of Labels. For example, say I want to put Cass on the spot by putting Freak and Danger in opposition; the suggested Hook Impulses are To remind them of collateral damage (Danger) and To play up their strangeness and capabilities (Freak). Will Cass revel in her full power and her badass-ness when Faun is egging her on, at the risk of endangering innocents as her grandmother warned? Each type comes with five subtypes and impulses (to help refine ideas) and five moves. They unfold in three phases: Setting the board, Making the moves, and Endgame. To create an arc, you pick a type, add a cast, flesh out what would happen in each phase if the heroes do nothing, and of course give the arc a snazzy name (e.g., The Menace from the Shadow Dimension, or Return of the Warmaster!) and a punchy description. Optionally, you may want to add some custom moves. And speaking of custom moves, Masks offers excellent advice on creating such moves for story arcs, important locations, special items, or to launch an episode. Finally, Magpie Games’ website offers great GM play aids to support the creation of villains, hooks and arcs, as well as a handy GM reference page with the agendas, principles, and GM moves (including playbook-specific ones.) If you were a subscriber to the Kickstarter campaign, you may also have received a PDF version of the upcoming Villain Deck, which not only offers 54 villains from the four generations of supers (Gold, Silver, Bronze and Modern), but essentially demonstrates how to create an interesting adversary. Masks is an excellent game that hangs well together and conforms to the genre it proposes to emulate. Therein lies a caveat: this is not an all-purpose superhero game. It’s great for the territory it maps out but not to play every superhero story: early Spiderman or the New Mutants yes, the Punisher or The Killing Joke no. This is not a criticism, on the contrary: the author is very clear on the type of play experience he aims to create. I was charmed by the way the use of Conditions and Influence nicely mimicked the teen drama of young superheroes. It gave the feeling that our team’s story revolved around our relationships and emotional states, not just about who punched who. Masks uses lots of “carrots” to support the genre rather than sticks to enforce it. The guided choices of the moves, the Condition mechanics, the ability to easily change trappings in response to player choices without causing the structure to collapse, all support easy improvisation that stays in the spirit of the setting. Funnelling the players’ input this way had a beneficial effect on our game; certainly our GM is the first we must thank for the way she handled players stepping out of the agreed genre, but she was also well supported by the system, so that our player banter was redirected as moves to inflict or remove Conditions, our Outsider worked with the team, and the ironic Cold War-Era breaking of the fourth wall smoothly flowed into a perfectly serviceable pair of villains. If you like the idea of playing young superheroes coming into their own, and the type of play supported by PbtA games, then fly! To the online store for the PDF ebook, and soon to your friendly local gaming store for a print copy of Masks. Posted on September 16, 2016 April 1, 2017 by mechanteanemonePosted in friends, games, Reviews, rpgsTagged actual play, Magpie Games, Masks, PbtA, reviews, rpgs, superhero, supers.